Sen. John McCain: Trump Owes Vets, Not Him, An Apology : The Two-Way Republican presidential candidate Donald Trump stirred more controversy by lashing out at McCain, saying he preferred "people who weren't captured." 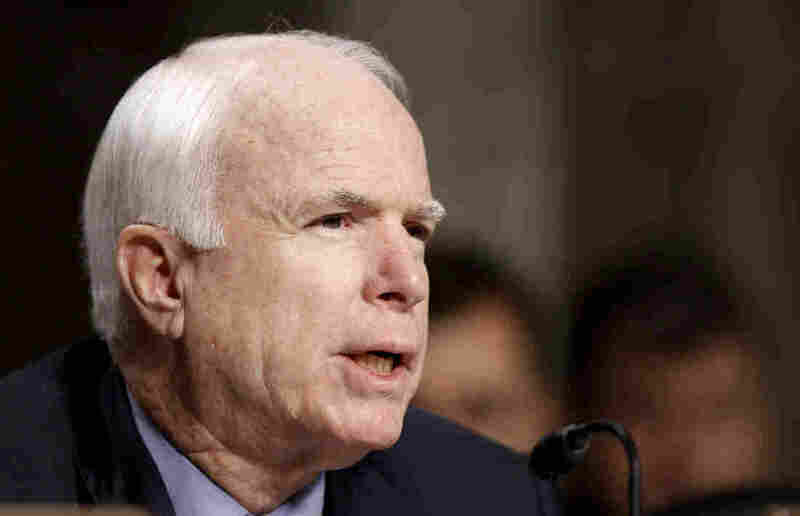 Sen. John McCain, a Republican from Arizona. Sen. John McCain took the high road on Monday, saying Republican presidential candidate Donald Trump did not owe him an apology. Trump, McCain said during an interview with MSNBC, "owes an apology to the families of those who have sacrificed in conflict and those who have undergone a prison experience in serving their country." "The great honor of my life was to serve in the company of heroes," McCain said. "I'm not a hero." Of course, all of this comes after Trump lashed out at McCain during the 2015 Family Leadership Summit in Ames, Iowa. As we reported, Trump said that McCain became a war hero "because he was captured." He went on: "I like people who weren't captured." GOP presidential hopefuls denounced Trump, and Sen. Marco Rubio said the remarks disqualified Trump for the GOP nomination. McCain said he thought Trump's comments denigrated the service of troops and he thought the comments were offensive. But, McCain said, he would not call for Trump to drop out of the race. That's for Trump to decide, McCain said.